Here’s a day we spent in Glasgow recently. If you are thinking of adding this city to your tour plan, then read on! — Some guy who used to write a lot of tourism brochures. That is a slightly complicated way of saying that, while you just stand and admire the views in Scotland’s capital, with downtown Glasgow you have to really look to appreciate the architectural heritage and city ambience. A few moments from our idiosyncratic but friendly, budget Z Hotel, we decanted ourselves into George Square - the very heart of the city. Here's a quote from an old pre-internet printed architectural guide, where the dominating building on the east side of the square - The City Chambers - is described as ‘a proud expression of the civic dignity, wealth and lavish decoration of 19th-century Glasgow’. Can’t put it better than that. Looks good at dusk/night too. Plus, there are free tours of the building, twice daily Mon-Fri. You sometimes don’t even need to pre-book. 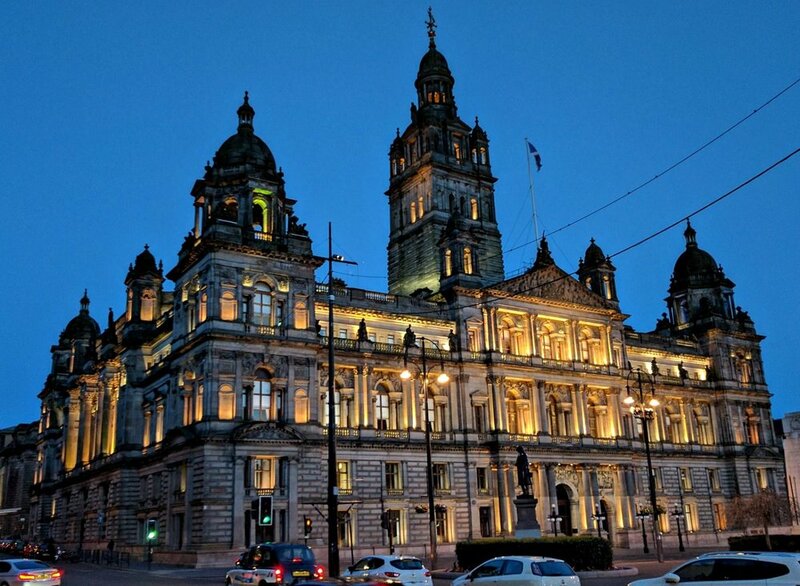 Yes, I know we started off here in the morning - but the Glasgow City Chambers looks good at night too. What and where is this Merchant City that has been for so long a pillar of Glasgow’s tourism marketing? Well, the original merchants were entrepreneurial Glaswegians who made vast fortunes trading in tobacco grown on the other side of the Atlantic. The trade was at its peak in the 18th century, before the USA declared independence (hurrah!). 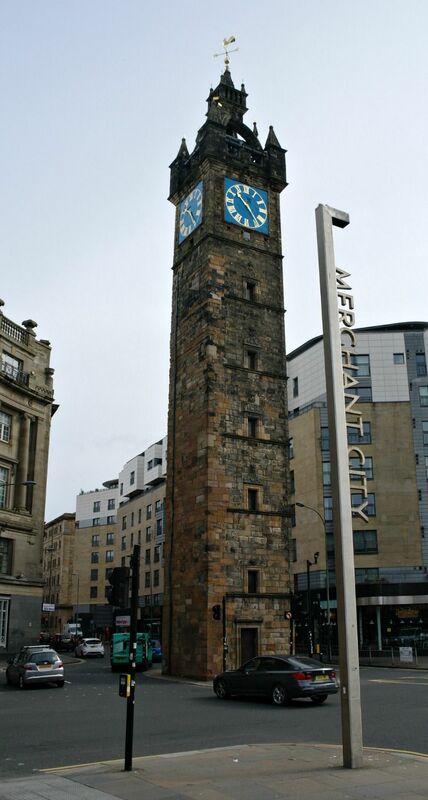 The Merchant City is a label for the part of Glasgow where the merchants formerly lived and also had their warehouses. It is greatly altered since their day. The so-called ‘Tobacco Lords’ were really involved in a dreadful trade, entirely dependent of slavery. 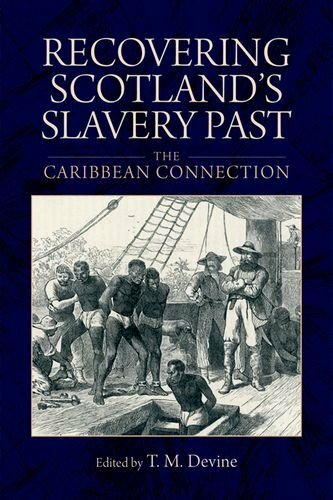 However, in Glasgow’s defence, by the early 19th century it became a leading light in the Abolitionist movement. Anyway, there was money galore sloshing around and some of the buildings that the tobacco cash funded still survive, east of the main shopping area today. Discover Distinctive 18th-century Glasgow architecture. There’s Hutchesons’ Hall (1802-5) with clock and steeple, closing the view up Hutcheson Street; and the Trades House (Robert Adam 1791-4) performing the same function on Garth Street, beyond the giant blue wheelie bins and beer kegs that are a reminder that this is an eating and drinking hotspot. And there’s much more architecture to admire: clever conversions - warehouses into flats, for example - or markets into exhibition spaces - and part of an old fruitmarket has been re-labeled Merchant Square. An explanatory notice outside says ‘Merchant Square - where it never rains’ - a reminder of just one of the advantages of having a roof. Basically, it’s a big hall with - guess what? - even more restaurants. Yes, there are lots of fine buildings: St Andrew's in the Square is an 18th-century A-listed former church, still considered one of the finest classical churches in the British Isles. The old Tolbooth steeple at Glasgow Cross, (c. 1625), once the centre of the city. We strolled eastwards towards the oldest part of the city. Glasgow expanded west from the environs of the Cathedral via the mansions and warehouses of the Tobacco Lords of the Merchant City. Next, we dropped down and past the Tolbooth to the Trongate (the continuation eastward of Argyle Street), where we were reminded of this city of contrasts. It isn’t stylish and trendy there. Just run down, with greenery growing out of the boarded up facades. And it’s five minutes from a jewellery arcade and the bustling Buchanan Street with its upmarket shops. Funny old place, this city. Let’s be blunt here. The middle of Glasgow - I mean the walkable part you reach, say, from Queen Street or Central Station - is mostly about shopping. And eating and drinking. And you can easily spend your day in Glasgow doing that and nothing more! More handsome Glasgow Architecture - look up ! Ten storeys high but only three narrow bays wide, with lots of design features to allow maximum light in, the detailing shows Art Nouveau influence. This is 'The Hatrack' at 142-144 St Vincent Street. So the city on first impressions divides into the prosperous shopping streets in the L shape of Buchanan Street and Sauchiehall Street, with the Merchant City just to the east. However, the joy of wandering about the ‘shopping streets’ is that, yes, there are indeed a thousand architectural details to note above the shop windows, especially if you look up. Eyes skywards to enjoy the Ca D’Oro building (John Honeyman 1872) and, further along the street by Central Station, the Grosvenor Building (Alexander Thomson 1862), the Hatrack (James Salmon 1899)...and so on and on and on until your neck gets a bit sore. Glasgow’s West End is another facet of the city and it can be included in a day excursion of the city. Go by the subway (as we did) or by taxi. Emerge, minutes later, from Hillhead station on to, say, Byres Road and, as well as the shops and the cafes, quite easily reached from this busy street, there are quite a few cultural opportunities. 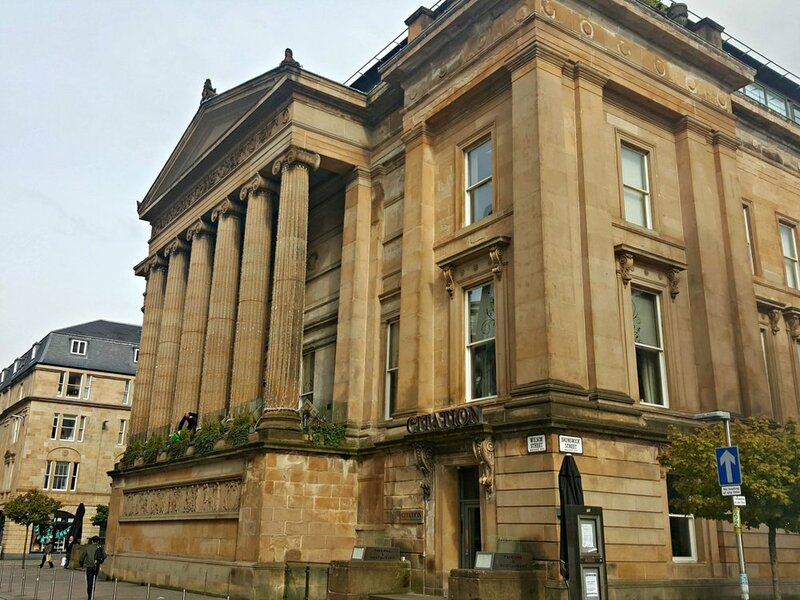 Scotland’s oldest museum, the Hunterian, located within the university precincts, is worth a look. As is the Hunterian Art Gallery - for instance, Whistler is well represented here, and also the Glasgow Colourists with their beautiful renderings of the light on the island of Iona. Plus the beautiful interiors of the Mackintosh House - they’re all here in a compact area. Kelvingrove Art Gallery and Museum from the University environs to the north. And, as we were so close, we went to pay our respects to the Kelvingrove Art Gallery and Museum. For generations it’s been up there amongst Scotland’s most popular free attractions - and with good reason, as it’s everything a ‘traditional’ ‘proper’ museum and gallery could be. We even managed to time it for 1pm and the (free) organ recital. And we got a seat in the cafe too! Kelvingrove features some of the finest civic collections anywhere in the British Isles. It’s the place to see the work of the painters known as The Glasgow Boys. It’s easy to get back to, say, Buchanan Street by subway, from Kelvinhall station. A door is opened - and we disappear into the depths of Glasgow Central Station on our guided tour. And we feel really important in our high-viz jackets. Right, time to get back to the city-centre. Our day was wearing on and we had a very important appointment. We all met below the ‘longitudinal ridge and furrow’ glass roof on the concourse of Central Station. We were going on a behind the scenes tour of Glasgow Central Station. Kitted out in high-viz jackets and hats, we joined our tour, led by the originator, champion, and promoter of the event, Paul Lyons. Central Station covers an area about two square miles and much of it is below ground. The tour took us back to the booming, bustling, noisy, filthy days of Victorian Glasgow, to arched walkways and old platforms, below hand-riveted girders well over a century old that are as good as they day they were installed. Paul also took us back to 1916 and the pathetic human cargoes of warfare that were dropped off on the platform for the womenfolk to view, identify (can you believe) and take away. Mostly, it was what was left of their menfolk. Before the policy changed and fatalities were buried in France, the British Army's responsibility for them apparently ended when the left them on the platform, a temporary morgue. It was, quite simply, the best guided tour we have ever done - period. Vivid, funny, dark and dramatic in turn, it left us with fresh insight into the life, past and present, of this grand station. NB You must book this tour in advance. The blog piece about the station tour is on that link. We were so reduced to silence and reflection by the Glasgow Central Station tour experience that we thought it would be good to mull it over in a proper pub. (Any excuse, really.) Glasgow has, uhmm, quite a few. We went to The Horseshoe Bar, because it’s the real deal, not hugely changed since 1888, apart from the introduction of salt and vinegar crisps, which we don’t think were around then. However, the grand Victorian bar is 104 ft 3 inches (32m) which makes it the longest in Europe, they say. Fortunately it’s in an oval - before I visited I always imagined it as a long thin counter. Stupid boy. Wrong. Tell you what, instead of where to stay in Glasgow, let’s tell you where we stayed for this particular day out, because it was a wee bit unusual, as well as being great value. We booked the Z Hotel, seconds from George Square. Couldn’t be closer to the centre. It’s a conversion from an old printing works, and still has that industrial, white-tile ambience. It’s rooms are quirky. Some have no windows. We booked what resembled a bathroom with an en suite bed. Functional, clean. Comfy bed. Fine for a few days. Better still, turn up in the multi-purpose public area between 5pm and 8pm and if you are a resident, they give you a glass of wine, and cheese and bread, on the house. That’s nice. Be careful if you are going out to dinner afterwards because it’s easy to have the extra half-slice of bread that will slightly kill your appetite for later on. Know what I’m saying? ABode Glasgow is a stylish four star Edwardian townhouse boutique hotel with lots of original features. It's only a five minute walk to George Square, city centre attractions and of course shopping areas such as Buchanan Street. If you fancy somewhere even more up-market in the city centre, then it has to be Blythswood Square - and at the leafy west end of the city then stay at the friendly One Devonshire Gardens for five star luxury. Glasgow has a huge range of great places to stay. 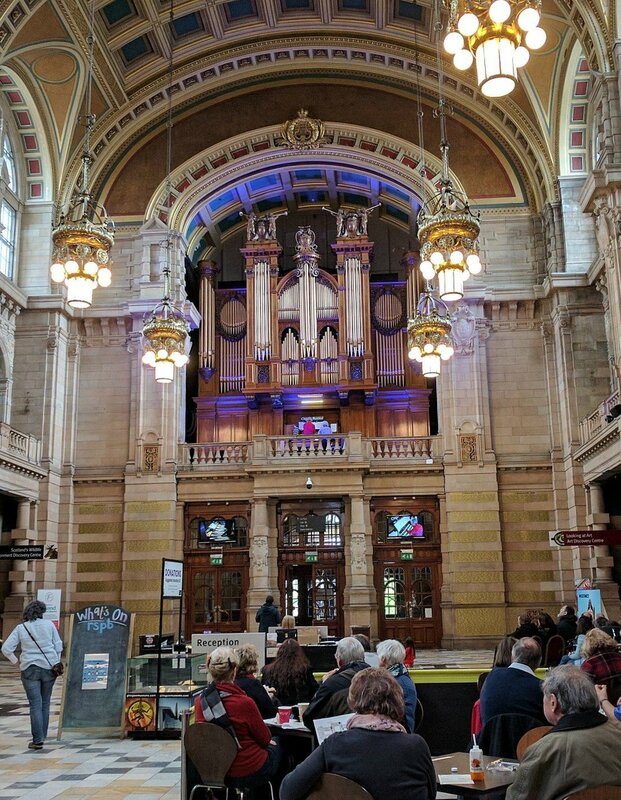 To recap, we had: a stroll in the Merchant City, a wander back up Buchanan Street, morning coffee at the most excellent Riverhill Coffee Bar in Gordon Street, caught the subway to the West End, walked via Ashton Lane to Kelvingrove Art Gallery & Museum. It was a very nice day. Sad to see so many people begging, especially the ones with dogs, but it’s only slightly worse than, say, Edinburgh. When Scotland becomes independent - and the city of Glasgow certainly voted that way - then perhaps we can put in place a more socially responsible and caring way of government and find a way of tackling the issue. But anyway, contrasts between rich and poor have always been a feature of Glasgow, though not necessarily its best one. Cities of Scotland - the must sees and the miss 'em outs! A must-read summary and quick description of Scotland’s 7 cities to help you choose which to visit. Essential Edinburgh, Stirling for the castle or Glasgow for the friendliness, unavoidable Inverness, handsome Perth and the rest! - we’ll help you decide.